So it’s that time. Hot, hot, hot, but also time for the first summer pool party in my neck of the woods. Of course, all are asked to bring a side dish or dessert. After much deep thought a ridiculously busy week (and spending some time trying to figure out how to get a picture posted on the same page as the post to which it refers) I decided to make one of my favorite sides. 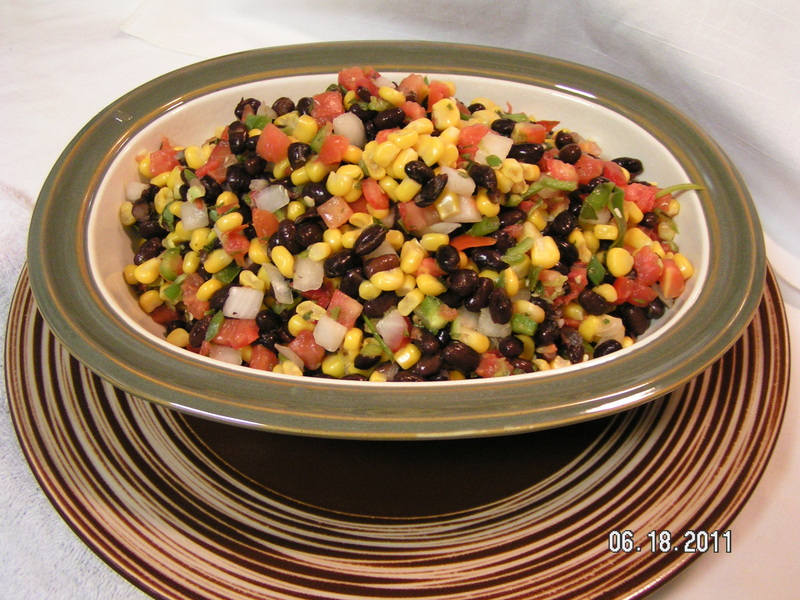 So, today I will be arriving with a black Bean and sweet Corn Salsa, always good for outdoor events. No mayo to give everyone food poisoning, so the kind overworked hostess won’t even have to find room in the overloaded fridge. Plus, easily put together on the spur of the moment! Combine 2 cans of Black Beans (though I rarely use anything from a can), drained well, with 2 cups of frozen sweet corn (thawed), and rinse well, until the corn is just cool. Add 2 cups of pico de gallo (today, thankfully pre-prepared by my local grocery) and toss gently…make your life easy and just use your hands. You can add extra peppers, diced, if you like to turn up the heat. I prefer serrano, but the reliable jalapeno will do also. I put all ingredients in the collander to drain, and transfer it into a serving bowl, or tupperware if you’re heading out the door. Voila! Now for a beer run, and I’m ready to spend the afternoon being hot having fun! Oh wow…skype screen share…yipes! I just finished the tutorial on how to put a picture under the text of my post. Aargh!! Too…many…new…things…(think captain Kirk voice here). And how did you say to make the smilies not dots?? ?